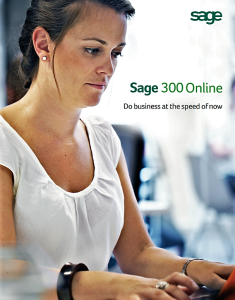 Sage 300cloud (formerly known as Sage 300) Online has strong roots, with over 60,000 businesses in 150 countries using the Sage 300cloud (formerly known as Sage 300) product line to manage their business. Sage 300cloud (formerly known as Sage 300) Online offers comprehensive solutions with built-in functionality that includes best-in-class financials along with project, operations, distribution, and business intelligence capabilities. Financial features support multi-currency needs and include powerful tools to keep your business compliant with government regulations such as GAAP or IFRS. Detailed item information empowers your employees to track lot and serial numbers. You can set up vendor purchase orders to generate automatically and to accurately track costs. It also presents valuable information in an easy-to-understand format. And you can sleep well knowing it regularly backs up your system in the secure Sage Data Cloud.